Though the satisfaction of customers should be a top priority of food truck businesses, making employees happy is also an aspect that must be focused on by mobile food entrepreneurs. According to a 2014 study from the University of Warwick, UK, there is scientific evidence on the correlation of happiness and productivity. The research showed that in three different styles of experiment where randomly selected individuals were made happier, productivity increased approximately by 12%. Making employees happy working for your food truck is not just about cash incentives. Factors like schedule, working conditions, sense of fulfillment, and career advancement, among others, can greatly affect the performance of a worker. That is why many big and successful companies today put a lot of effort in keeping their employees happy, not just for altruistic reasons but because there are real business benefits in doing so. Having a better employee retention can help a food truck business limit the cost associated with hiring and training new workers. Employee turnover can cost $9,444.47 based on the averaged results from 15 studies that determined the average cost of replacing an $8 per hour employee, according to calculations by the Sasha Corporation. Being able to retain employees means business operations are less likely to be interrupted. A short-staffed food truck may need to temporarily modify its menu, limit vending locations, and even refuse participating in events that can lead to missed opportunities and less revenue until a new employee is hired. Having enough workers also ensure that employees are not overworked, which is important to keep the quality of the products and services of a food truck consistent. Happy employees are also more likely willing to go beyond the call of duty because they have a sense of fulfillment in their work. Happy and satisfied employees are more proud to tell others about their jobs. This means you have a group of potential advocates for your food truck business that can increase your customer base. But if your employees are unsatisfied and complain about your mobile food business to their family and friends even in passing, it can have negative effects to the reputation of your food truck. The opinions of employees about your food truck have weight because they are perceived to be insiders. Word of mouth is a powerful marketing tool (now more than ever in the age of online reviews) so it is better when people have less or no bad things to say about your business. Happy employees are not just productive, they can be loyal as well. This can give a food truck owner a group of trusted people that can help grow the business. If you decide to expand and have more trucks, these employees can become your managers and you are rest assured to their quality of work unlike when you hire someone totally new. Now, after knowing some of the advantages associated with keeping employees satisfied, what can you do to reap these benefits? Some may think that increasing salary or giving bonuses are the best ways to prevent someone from resigning. But even though employees will not turn down cash incentives, there are other ways that might be more effective (and less costly) to make your food truck staff happy and productive. Assess your staff and give them tasks where they excel. If people do things they are good at, they get gratification each time the work is done instead of getting discouraged by work they have trouble figuring out. Explaining the meaning or effect to the business of certain tasks also let employees understand their role and contribution to the business.When a person knows the point and importance of the work, they will less likely to take it for granted. It is also a good idea to let employees discuss the work schedule instead of the owner choosing it in an arbitrary manner. Asking for their input and letting them participate in the decision-making ensures that employees will adhere to the schedule everyone agreed up. Allocate a day for a staff meeting to discuss the schedule for the following week. Prepare a list of available work hours that needs to be filled, keeping in mind the future activities your business will involved in like regular vending days and event days. It is also best to set well-defined ground rules for deciding employee schedule to prevent conflicts or disagreements. In any type of relationships, communication is key. Let employees know that their options matter by making it easy to approach you as the food truck owner. An open door policy not just for complaints but also for ideas can be great for your business. Quickly resolving conflicts or issues raised by employees must be a priority to minimize any complications that can impact business operations. Also, giving positive feedback when it is due can go a long way. Commenting on your employees’ performance gives them a sense of how they are doing and where else they can improve. Make sure to be specific in giving praises or credit because a standard “well done” can sound insincere. At the very beginning, it is best for food truck entrepreneurs if they can help employees advance in their careers. The food service industry is considered to have a high employee turnover rate because typically, most people do not plan for a long-term career in the field. But with the right pay and potential professional advancement, some employees can be encouraged to stay.One way that food truck owners can offer professional advancement is by helping employees get continued training. Offer to pay for your employees to get new skills that you can utilize in the business and give them more responsibilities as they improve. Another way is by sharing the business goals like expanding your food truck fleet and the potential for a management position in the future. An mobile food entrepreneur cannot do everything alone and without employees willing to work for you, the business will not operate. Yes, they are paid to do the job but as any food truck owner can attest, the necessary work can take more than the average eight-hour job. It takes a passionate and diligent person to work in a food truck. Expressing your gratitude for the contribution of your employees is a simple but effective way to show that they are appreciated and that their hard work matter. Just think of it this way: most likely, these people can do something else or work for someone else, but they chose to work for you and help realize your dream. Hiring new employees is a natural part of businesses. But additional members of the staff must be chosen carefully as they can change the dynamic of long-time employees. Be sure to take into consideration potential employees’ fitness to your “company culture” instead of hiring based solely on skill. New employees can clash with your current employees if they do not believe with the same professional values and this can affect the mindset of your long-time employees. Encouraging a culture of fun instead of stiff working environment can also make your staff feel at ease and not dread going to work everyday. Though it should be a given, employees are happy if they are fairly paid for the amount of work they provide. Because food trucks are limited in scale compared to restaurants, most employees can understand if you cannot provide extravagant wages. But compensation can take other forms as well: a free lunch once a week or a birthday day-off can be much appreciated and are low-cost ways to compensate employees. Having a food truck business supported by satisfied and productive workforce leads to stability, lower costs, and more potential for growth. At the end of the day, what mobile food entrepreneurs should always remember is though money can entice some employees to put up with working conditions, even cash has its limits and no amount of money can buy what matters most in business: loyalty. Keeping a food truck business competitive is a challenge that entrepreneurs must be ready for. Year after year, the array of mobile food businesses that customers can choose from just keep on increasing, which makes it ever more important for a food truck to make a lasting impression. And this can be achieved with great branding. But what exactly is branding? Some may think that branding and marketing are the same thing but traditionally, each has its own significance for your business. Branding is the fulfillment of a business’ promise and also shows a company’s characteristics and identity. Successful branding delivers the impression that customers get after experiencing your food truck’s products and services. It is more strategic, encompassing all the aspects of the business, and answers the questions of why the food truck exist, what it stands for, and what value it provides. A successful brand resonates, pulls, and transforms people into loyal customers. If branding is strategic, marketing is more tactical and consists of specific activities that support your brand. It includes actions that push your message to activate buyers. Usually, marketing campaigns have shorter time frames than branding efforts and are crafted for particular aspects of the business like launching new products or announcing promotions. Knowing the difference between branding and marketing is the first step to creating a successful and strong food truck identity. Defining the business brand should be a priority of food truck owners or risk losing control of how customers perceive it. Fortunately, there are many ways mobile food entrepreneurs can be creative in building their brands. Based on how it appears, customers can make a split second decision whether to buy or not from a food truck.The name, color theme, logo, slogan, menu design, and product packaging can create a story that affects how appealing a food truck can be. Just like how a dish looks like affects its perceived flavor, the food truck’s appearance can greatly influence the experience of buyers. Based on research, certain visual cues can increase the effectivity of your food truck’s design, for example, warm colors can attract attention and stimulate hunger. In addition, the food truck’s online identity must be consistent with what customers will experience on the field. This consistency helps reinforce brand recall and makes it easier for satisfied customers to point prospective buyers to your food truck. Branding is not just what people see but how they feel. Food trucks are not just in the business of providing delicious dishes but offering unique and enjoyable experiences. This makes convenience a great selling point for mobile food businesses. Designing your business operation to make it as easy as possible for buyers to get their order can encourage repeat sales and recommendations. An efficient ordering system is a great area to start with. Online and mobile tools can also be utilized (like getting advance orders via social media or an app) to decrease the amount of time customers need to spend in line. In lieu of having a dining area, designing the packaging of products to make it easy to eat on the go is also a great way to encourage people to buy from your food truck. Another way to provide a great customer experience is with convenient payment methods. With the growing demand and popularity of mobile payments today, food trucks that can process payments beyond credit and debit cards is an advantage. Online payment services integrated with your mobile business’ website enable users to place advance orders. In addition to hassle-free service, people love having choices. If your products permit it, giving customers the option to customize orders has always been a great way to add-value. Pizza restaurants have been successful with this strategy and Starbucks has capitalized on customers’ obsession with personalized coffee drinks to increase the demand of their products. An aspect of the mobile food business that leaves a huge impression to customers is their interaction with employees. This is not limited to the behavior of workers but can also involve their attire. A customer will most likely trust food coming from a well-groomed person than from someone who looks sloppy. Strengthening customer confidence can also be accomplished when they are given access to information regarding your products. Food data like dietary and nutritional values, allergen alerts, and sources of ingredients can reassure buyers with the quality of your products. Your food truck’s brand narrative that may include providing safe and healthy options, using organic and cage-free ingredients, or supporting local farmers can be reinforced by keeping customers informed. In addition, having the ability to easily voice out their comments or inquiries and getting timely feedback from your business is something that customers will appreciate. It also gives buyers the impression that your business is willing to improve by accommodating their requests. If they see that you and your business are listening, buyers are more encouraged to communicate and create a relationship. The goal of successful branding is leaving a lasting impression to customers. There are many ways of achieving this but looking at the most successful brands today, there are several key factors that these businesses have in common. Consistency: Though first impressions can last, loyalty can only be developed with repetition. If customers experience the same high quality of products and services each time they buy from your food truck, there is higher probability of continued patronage. People gravitate to familiar or comfortable experiences and using this innate characteristic in your food truck’s branding encourages greater success. Brand recall is also easier to establish if customers can easily associate your business to certain positive images or feelings. Coordination: Branding represents the identity of your food truck business. Every aspect of the venture (marketing, sales, customer support, and others) can affect its success or failure. Having a concrete framework that aligns the activities in the different parts of the business ensures that they will not conflict with each other. Research: Though customer impressions of businesses can be based on emotions, your decisions as a food truck owner should be motivated by information. Know your target customers by using focus groups or surveys. Understand your competition by researching their branding efforts. Analyze the industry landscape by gathering economic and government data based on relevant factors (fuel prices, sources of ingredients, laws and legislation, among others). Resonance: Showing the values and traits that your business have in common with customers leads to a stronger brand. Make your branding efforts personal and intimate. Tell the story of your business, what it stands for, and why it is relevant to people. Businesses that appear to exist solely with the aim to profit rarely gain long-term success. Vision: Usually, marketing has a shorter and more limited scope than branding. But just because you have defined its identity today, it does not mean a business cannot change. Circumstances can shift and may force your food truck to grow or adapt. Having contingency plans ready for different possibilities of re-branding or brand expansion can keep a mobile food business from being caught off guard. With higher competition, creating a unique food truck brand today takes a lot of planning and effort. But having a well-defined business identity benefits your mobile food business by giving it a sense of direction and a powerful connection with customers that can turn them from one-time buyers into loyal customers. Funding has always been one of the biggest challenges for entrepreneurs who are trying to start a mobile food business. Though starting a food truck business would require lower capital to get up and running compared to launching a brick-and-mortar restaurant, a potential owner must not miscalculate the amount of money required. Knowing the different options on how to raise funding and weighing which are the ones that will be best suited for your business can greatly impact its future success. If it is available, there are some advantages in using your own money to start a business. Self-funding a food truck means not incurring debt in the beginning of the business life-cycle, making loans an available option for future needs. Also, using your own money means you keep all the profits earned by the business. This is rather beneficial because your business will have a bit of flexibility to grow instead of being forced to generate a certain amount of revenue so that a loan can be repaid. Though self-financing is one of the best way to fund a start-up, it can only be done if you actually have enough available cash at hand. For those who do not have savings that can be used as capital, it can take quite a while to raise a significant amount of money. This can lead to you shelving the business idea temporarily or taking another route to financing your start-up. For many people, borrowing money can be a touchy subject. Whether it is from family, friends, or financial institutions, debt has a negative connotation in most people’s minds. But taking up a loan is not always bad as long as it can be considered as “good debt”. Good debt is money borrowed with the potential to gain a return through investment. But before rushing to the nearest bank, try to consider asking your family and friends first if they can lend cash that will help jump-start your food truck business. The advantages of borrowing capital from family and friends are the flexibility on interest rate and repayment period. More often than not, relatives and friends will only ask for the lowest interest rate (some may even forego it completely) and they will be more lenient in case of missed repayments. Borrowing money may look more appealing now but what if your family and friends do not have the funds? An entrepreneur’s next option are financial institutions, particularly, banks. Getting a loan from a bank is a whole different scenario. Unlike close personal relations where the negotiation and approach to borrowing can be informal, approaching a bank will be a no non-sense affair. Qualification is a big factor in getting a bank loan. A good credit history is very important and having previous business experience and no outstanding debts can increase your chances of getting the loan approved. Another big factor is the presentation of your business idea and financial plan. A fully-formed business idea with market research, financial projections, and even an exit strategy (or strategies) can improve the perception of your venture’s viability and reassure the bank that the loan will be repaid. One of the disadvantages when it comes to getting a loan is the reduction in profits. Allocating a certain amount of your business revenue for repayments would mean your financial goals (whether personal or professional) may take longer to reach. Another drawback is having to worry about monthly loan repayments that can give added stress or distraction which can impact your business performance. Another way to get financial assistance from family and friends is by inviting them to become investors. The advantage of asking for investment instead of a loan is the spreading of financial risks. In case the food truck business fails, a loan will still have to be repaid but an investment does not have to be returned. Also because dividends are based on profits, the operating budget of your business does not need to be reduced just to give returns to investors, making this financing option less stressful and less risky than incurring debt. But having family or friends as investors can put a strain on your relationships if the details of the investment are not spelled out comprehensively. Adhering to a “company constitution”, a list of rules and roles that will guide the business owner and investors on what are to be expected from them, can prevent any complications from arising. Depending on your preference, you may let investors participate in running the business. But persuading investors to be silent partners is an option that can stop the business drama from spilling over to your personal relationships. The rise of online crowdfunding platforms give mobile food entrepreneurs a new way of financing their dream businesses. Most crowdfunding websites are intuitive enough that setting up an account and starting a campaign will only take a few minutes. And with a great idea, presentation, and right incentives or rewards, people can back your food truck idea with monetary contributions. Crowdfunding is considered as a low risk financing option for mobile food businesses because an entrepreneur only need to have a compelling idea, commitment, and a bit of creativity in spreading the word about the campaign. This is a unique way to fund and even run a business because the marketing part happens even before the product is available to customers. There are also insights to be gained based on people’s reactions to the campaign, giving entrepreneurs valuable data that can be used to tweak and improve the original idea. Customer participation also has a positive effect because backers can become “evangelists”, as long as the promises of the crowdfunding campaign are fulfilled. Taking part in the building of a business by backing it through crowdfunding makes most people feel invested on its success, even if they are technically not considered as investors because they will not get future returns beyond the rewards offered during the campaign. This sense of “investment” is a powerful psychological pull that mobile food business owners can capitalize to create brand loyalty and also attract the interest of other customers. Yet, despite the simple mechanics of crowdfunding, it is not as easy as making an awesome presentation video. It is low risk because entrepreneurs do not have to shell out a lot of money to get started. But creating a compelling narrative that will persuade people to give you their money is an art on itself. Differentiating your food truck idea in a crowdfunding platform can be a challenge today, with the industry starting to saturate as more mobile food business launch year after year. Also, planning the campaign very carefully is crucial. Many crowdfunding initiatives fail because entrepreneurs underestimate the amount of work, commitment, and consistency needed. Some also set funding goals without careful cost-benefit analysis that either makes it impossible to achieve or cause the business to run out of money right after launching. Failure to deliver on your campaign promise can also lead to irreparable damage to the food truck’s brand, so only offer realistic rewards in exchange to people’s backing. It is also worth noting that in some crowdfunding platforms, money will not be released if the final goal is not reached. Some entrepreneurs may find this discouraging and may think all the hard-work during the campaign had been for nothing. It is best to learn and understand how a crowdfunding platform work before utilizing it to fund your food truck business. Cash is the life-blood of any business. But as a food truck entrepreneur in the twenty-first century, you have a lot more options than those who came before you. With a compelling idea, steadfast commitment, and a bit of creativity, you will realize that there are always options to solve financing challenges for today and even those that will come in the future. Being a part of modern life, refrigeration is something that many of us do not really pay attention to. But for food truck entrepreneurs, not understanding this process and how it affects the quality of food can spell disaster to the business. Here are some challenges that mobile vendors need to understand regarding frozen food products. Keeping frozen food at a safe temperature is one of the biggest challenges when it come to food trucks. This is dependent on the design of your electrical system. Food truck operators that want to use their refrigerators while in transit can use generators or dedicated battery banks to operate the equipment. But some states do not allow generators to be operated inside trucks while others do, as long as the vehicle is fitted with an exhaust system and have sufficient ventilation. Mounting the generator outside the truck may be a good solution. Some suggest using the batteries of the truck to keep the refrigerator or freezer powered up but this may only work for small appliances (usually those that only require 12Volts to operate). Commercial-type refrigerators often run on 120Volts. It is best to check local health codes and regulations to make sure if you can install such electrical systems to operate refrigerators or freezers while in transit. Fortunately, modern refrigeration equipment can keep its contents cold or frozen even if it is turned off, as long as the food to be transported has been pre-cooled to zero degrees Fahrenheit (-18 degrees Celsius) prior to loading. A full freezer can keep its temperature for up to 48 hours (24 hours if half-full). This means you do not have to keep the equipment powered on while traveling from one vending spot to the next. How to maintain consistent temperature of frozen products? How to label and rotate inventory of frozen food? What is the quickest way to serve frozen product? What to do when the freezer suddenly fail? Because frozen food are perishable items, having the right procedures for storing, handling, merchandising, and contingencies will not only preserve the safety and quality of your products but also help prevent added costs or profit loss to your business even in time of emergencies. Make sure your refrigerator or freezer has a thermometer to make sure food are kept at safe temperatures. The safe temperature for refrigerators is 40 degree Fahrenheit (4 degrees Celsius), while for freezers is zero degrees Fahrenheit (-18 degrees Celsius) or lower. When choosing vending spots, know where you can find dry ice or ice blocks on that area in case of emergency. When the power goes out, keep the doors of refrigerators and freezers closed as much as possible. Full freezers can hold its temperature for about 48 hours (24 hours for half-full). If the freezer is not full, arrange the contents to form an “igloo” so that food that do not easily thaw can keep others cold longer. Separate frozen raw meat by putting them on trays to prevent their juices from dripping to other food when they begin to thaw. Discard perishable foods that have been above 40 degrees Fahrenheit (4.44 degrees Celsius) for two hours or more. When in doubt to the quality of the food, throw it out. For frozen food, check for ice crystals. Food that have been partially thawed can be safely refrozen if it still contains ice crystals or has a temperature of 40 degrees Fahrenheit or below. Never test the safety of food by tasting it. Foodsafety.gov provides convenient charts that can help you evaluate whether to save or throw out food in case of power outages. This can be the trickiest challenge when it comes to frozen food. Different products require different storage temperatures. Knowing the right storage temperature not only affects food safety but also food quality. Heat shock, temperature fluctuations due to the process of freezing, thawing then refreezing, can cause the development of ice crystals (most noticeably in ice cream) that can affect texture, consistency, and even taste of products. Another example is delicate leafy greens that are susceptible to freezing or wilting when not stored at the right temperature. But the science of frozen or refrigerated food is not limited to storing. Knowing how to properly thaw or defrost food for preparation is vital to avoid negatively impacting the way they get cooked. Moisture build-up on the surface of certain foods (like french fries or breaded chicken) due to temperature fluctuations can lead to uneven browning, flaky texture, or drying out, which can turn off customers. Improperly stored or thawed food can also impact the usable life of frying oil and increase your operating costs. Refrigeration and frozen food are blessings to mobile food vendors due to the convenience they provide. Inventory with long shelf life, a wide variety of available products, and the ability to create various dishes anywhere free food truck businesses from limitations. Ideally, nothing can compare to the taste and nutritional value of fresh ingredients but frozen food can also have its advantages. And with adequate planning, good research, and proper implementation mobile food entrepreneurs can break the ice, get pass the challenges, and succeed with frozen food products. Perception has always been a powerful factor that affects businesses. And the integration of high technology to the everyday lives of customers is starting to influence how they evaluate, choose, and pay for products and services today. As the near-omnipotent smartphone pushes the boundaries of convenience, mobile and contactless payments like Apple Pay are gaining more traction, setting expectation, and affecting perception on businesses that could not keep up with the changing technology and behavior of consumers. Due to their mobile nature, food trucks project a certain expectation of convenience to customers and can greatly benefit from utilizing mobile payments. But choosing the right system is vital. There are many products and services that offer food truck owners the ability to integrate mobile and contactless payments into their operations, but most are designed as accessories to consumer-grade hardware. Some have limited functionality, lacking the ability to process contactless payment transactions like Apple Pay. This can give a “non-professional” impression to customers. Investing on a mobile point-of-sale system that is feature-rich and “future-proof” is important for food trucks. Apple Pay is the latest contactless payment option now available to customers. With more and more companies adopting the payment service, many believe that use of Apple Pay is going to grow even further in 2016. According to a 2014 Business Insider article, one million credit cards have been registered to Apple Pay in the first 3 days of availability and made it the largest mobile payment system in the US, at that time. Despite having contactless mobile payment options before Apple Pay, the service is getting attention due to its simple, integrated, and secure features. Utilizing the Touch ID sensor in the latest iPhone models, Apple Pay solved inconveniences and issues that many experience in other platforms. When integrated to your food truck business, there is no need to ask for identification cards or signatures from customers anymore because their identity has been verified by their fingerprint. Business liability for fraudulent cards are also minimized or even eliminated, saving entrepreneurs from financial losses and needless stress. In addition, the natural motion of holding the phone and touching the biometric sensor speeds up the payment process and turnaround for each purchase. Shaving off even a few seconds by eliminating the act of “getting wallet from pocket, taking card from wallet, handing card to cashier, swiping card, signing receipt/typing PIN/checking ID, giving card back, putting card to wallet, and putting wallet to pocket” results to faster food truck service and more satisfied customers. Apple Pay is also great for customers who do not want to share their personal information. Without the need to give a physical card, customers do not have to show the cashier their name, account number, or security code. Customers are also reassured that they will not be victims to crimes like card skimming. With more merchants integrating Apple Pay to their system this year, food truck owners should consider accepting the contactless mobile payment to reap the benefits linked to it. On top of faster and safer transactions, food trucks that can accommodate Apple Pay can enhance customer perception of the business and help boost brand value. If Starbucks, KFC, Domino’s Pizza, and Cinnabon believe it is worth integrating, maybe your business can benefit from Apple Pay too. Need help on how to start accepting Apple Pay in your food truck business? We can help! Being a unique niche in the food industry, working with the right type of expert to handle your food truck’s books is vital due to the mobile nature of the business. “Food trucks and food vending is such a volatile industry. Small menus, mobility, and changing regulations all have a great effect on success or failure. This volatility makes for an added adventure that most chefs and owners live for. Each day is a fresh start with its own unique challenges and blessings,” according to Cherie-Lee and Joshua Mason upon sharing their thoughts regarding the food truck industry’s differentiation to other niches. Their company, Panther Bookkeeping, specializes in bookkeeping for food trucks and food vendors. Food truck owners are motivated by their passion of providing delicious food and great service but rarely get excited with analyzing the balance sheet. But seeing that cash flow is considered to be the lifeblood of any business and its management can either spell the success or failure of a venture, having organized bookkeeping is extremely important for food truck and food vending entrepreneurs. Cherie-Lee and Joshua Mason understand this well. Motivated by the freedom to do what one enjoys, love of food, and admiration for small businesses, the two US Air Force pilots decided to extend their expertise and assistance to passionate mobile food entrepreneurs who become less enthusiastic when keeping track of the business’ financial side is concerned. “Cherie-Lee’s family has been in the food vending business for the last 4 years and we have seen some of the struggles and victories that occur on a regular basis. Many of the chefs and food truck owners we talk to have neither a love of numbers nor the training to keep their books or analyze them in a helpful way,” says Joshua. Though handling your own bookkeeping is not impossible, business owners can greatly benefit from hiring an expert. Getting on top of a food truck’s financial statements can be challenging due to the long to-do list required to operate the business. Keeping track of receipts, invoices, withdrawals, and deposits plus analyzing what they mean to the current and future status of the business can be daunting to most people. Fortunately, professional bookkeepers or accountants can assist entrepreneurs make sense of their financial statements and even give invaluable information or analysis to help grow their food truck business. Compared to a conventional restaurant, the factors that affect the profitability of food trucks are varied and very dynamic. Consulting with experts who understand these factors offer advantages to entrepreneurs due to the extensive analysis and insights they can offer. Some financial hurdles may be overlooked if the bookkeeper is not well-versed on how much the mobile nature of food trucks affect the performance of the business. Factors such as low margins, limited storage capacity, and high seasonality, among others, can greatly impact revenues while failure to plan for them can be the end of a food truck, no matter how great its concept or products. Some entrepreneurs may think is it wise to do their own bookkeeping first and just get help later on. But failure to have a plan and system based on reliable information, especially financial information, is one of the most common reasons why food trucks get into trouble. Getting expert financial advice at the early stages of the venture to create a plan that prevents problems can save a food truck business later on. Though not all future issues can be prepared for, juggling a food truck’s operation while trying to fix a financial problem can often lead an entrepreneur to break under pressure and the food truck to fail. Without a plan business owners will have even less time to solve a problem if one arises, which is why it is best to ask professional help and plan for contingencies as early as possible. “It is going to be tougher than they thought, harder work than they expected, longer hours than they want, and not as profitable, at first, as they dreamed,” as Cherie-Lee puts it. Accounting is the language of business and bookkeeping can be a great way to assess a food truck’s current success. An experienced professional can offer much more information than the current status of your business. Receipts, invoices, and deposits can provide important information that can guide food truck owners on how to efficiently manage and grow their business. The financial information, when analyzed by capable bookkeepers, can reveal key performance indicators: quantifiable measurements that affect the success of the food truck business such as food cost percentage, sales per head, bestselling items, staff performance, customer satisfaction, marketing cost, and conversion rate, among others. Key performance indicators can be used to advise business owners whether to continue with the current business plan, reevaluate certain operations, or change the direction of the business. Such vital information can be drawn from analysis that specialized accounting professionals provide. Make sure to check out Panther Bookkeeping to learn more about their company and learn how to keep your bookkeeping up to date. Also check out Xero, the software Panther Bookkeeping uses, which helps manage anything from bills & expenses, inventory, purchase orders, and much more. Clover food trucks will automatically sync with Xero to help make your bookkeeping easier. The features and benefits that Food on a Truck uses are optimized to help your bookkeeping more organized with help in your location and schedule management, sales trends, hourly sales, and more. To learn more about these features (and compare them with Square) make sure to request a comparison here! About Joshua Mason & Cherie-Lee Mason. Joshua Mason is a pilot in the US Air Force as well. He graduated in 2009 from the United States Air Force Academy with a Bachelors of Science in Humanities and Minors in Russian Language and Philosophy. He is currently working on graduate studies at Embry-Riddle Aeronautical University seeking his Masters in Business Administration in Aviation. He admires chefs and owners who have taken the bold step and launched a new endeavor in the growing industry of food trucks and food vending. Food trucks represent a sense of freedom and adventure. He feels that few chefs and owners are trained in financial accounting and many find bookkeeping a stressful hassle and distraction from their normal operations. He would like to take that stress and give you back your valuable time. Cherie-Lee Mason is currently a pilot in the US Air Force. She is a graduate of the Air Force Academy where she studied Astronautical Engineering and of the American Military University where she studied Business Administration. Food trucking/vending has been the family business for the last 4 years. She wanted to use her recent business knowledge and her passion for financial organization and number crunching to help those that are passionate about their food business but not so excited about keeping track of the financial side. Above else, food safety must be the priority of mobile food entrepreneurs. Knowing how to properly store, handle, and cook ingredients can prevent any risk to the health and welfare of customers, not to mention damage to your food truck business. Mishandling food being sold to customers can have a huge impact, not just to your business but to the food truck industry as a whole. According to a recent article in the TIME Magazine, the initial findings by the World Health Organization shown that there is a growing problem when it comes to food-borne illness worldwide. There was 582 million cases of 22 different food-borne diseases documented in 2010, with associated deaths of 351,000. These trouble figures should serve as a reminder to food truck operators that the threat of improper buying, handling, or storing of food can be a great threat to the lives of their customers. The negative effect of mishandling food served to the public is not only a health issue but can also become an economic problem. A bad experience due to a contaminated food truck product can result to negative publicity that the industry cannot afford to have. At the moment, the food truck market is still growing and even though many customers have embraced mobile cuisine, the industry is still under great scrutiny in many places. Even one case of food poisoning can become a death sentence for a food truck business. Consequences of such incident can include legal liability, victim compensation, loss of sales, and damage to reputation, not to mention the stress of knowing your business is the reason for another person’s suffering. These consequences can also affect other business and the food truck industry as a whole. Which is why mobile food businesses must put food safety at the top of their priorities. Time, skill, and money should be invested in making sure that customers will receive food that are delicious, affordable, and above else, safe. Depending whether they are bought fresh or frozen, fruits, vegetables, and meat have different requirements when it comes to their preparation. Fresh produce must be inspected for bruises or damages. If buying pre-cut fresh produce, only purchase those that are refrigerated or surrounded by ice. Also, only buy the amount of fresh ingredients that can be used or consumed immediately. Some fresh fruits and vegetables, particularly those sourced from far places, are harvested before they are ripe to prevent damage while shipping. They can travel for days or weeks, arrive in the local grocery store, and then sit on the shelf for several more days. At this point, they have ripen but have less than optimum quality and nutritional content. Buying locally sourced fresh ingredients is the best assurance that they are safe, have high quality, and still retain their full nutrients. Frozen ingredients may not be appealing to some but frozen produce and meat can provide great benefits. Freezing ingredients extend their shelf life and in most instances, lock-in nutrients and prevent moisture loss. Some frozen fruits and vegetables can have more nutrients compared to those that have been left on grocery shelves for several days. A series of studies have shown that after three days of storage, frozen blueberries contain higher polyphenols and anthocyanins, while frozen broccoli has higher vitamin C and beta-carotene. Frozen sprouts have higher over-all nutritional content compared to shelf-stored fresh variant. Some vitamins and minerals may be reduced or damaged by the freezing process, but if fresh ingredients are unavailable or need to be sourced from long distances, frozen ingredients can be a good alternative. The bruise and discoloration in fresh fruits and vegetables is often just physical damage to the produce’s cells, letting oxygen in and break down the cell walls. But it is advisable to use bruised produce immediately as they can experience deterioration and development of molds if left too long. If there are indication (through smell or sight) that the fresh produce has fungal activity, discard it immediately. If the fruit or vegetable is already showing signs of infection, do not attempt to salvage it by just cutting away the uninfected part. It is better to be safe than sorry, as the saying goes. Proper hand washing is critical! Also, hand washing before and after handling ingredients (even fresh produce) is extremely important. The United States Food and Drug Administration suggest washing your hands for at least 20 seconds with soap and warm water. Washing the ingredients under running water, regardless whether they are grown conventionally, organically, or harvested from your home garden, is also vital. Drying produced using a paper towel or clean cloth after washing can help reduce bacteria that may still remain. Handling potentially hazardous foods (those that require to be refrigerated or frozen) can be a challenge. Never take potentially hazardous foods out of storage unless they will be used immediately. Rotate inventory by implementing a “first in, first out” system to ensure ingredients are used before their expiration dates. Use separate containers while preparing or thawing frozen ingredients to prevent water or juices from contaminating other ingredients. Always ensure proper cooking temps! Also, ensure to thaw frozen ingredients safely to limit bacterial growth before cooking. Thawing frozen meat inside the refrigerator is the best option, though it can take a long time. Another way is to defrost frozen ingredients inside sealed packages using a basin of cold water (a pot, a bowl, or in the sink) and leave it submerged for 30 minutes, then change the water until the food is defrosted. Never use hot water to defrost frozen ingredients because the heat can warm the surface of the food and can lead to faster bacterial growth. Some frozen pastries can be defrosted at room temperature or using a microwave but it is not advisable to use these methods to thaw meat, fish, and vegetables. Some suppliers of frozen food also put instructions on how to handle their products and it is best to adhere to these recommendations. Fresh ingredients usually only last for several days. Never buy and store fresh ingredients if they cannot be used or consumed immediately. Store perishable ingredients at a temperature of 40 degrees Fahrenheit or below. Always refrigerate pre-cut or peeled ingredients to keep their quality and nutritional content. It is always advisable to store fresh ingredients (even fruits and vegetables) separately because various types of food can degrade in different rates. You can freeze almost every food to store them but whether their quality will remain after defrosting is another matter. Having separate thermometers for refrigerators and freezers is the best way to make sure that safe temperatures are being maintained. Safe temperature for refrigerators is 40 degrees Fahrenheit (4 degrees Celsius), while for freezers is zero degrees Fahrenheit (-18 degrees Celsius) or lower. Storage equipment must be checked and cleaned regularly. 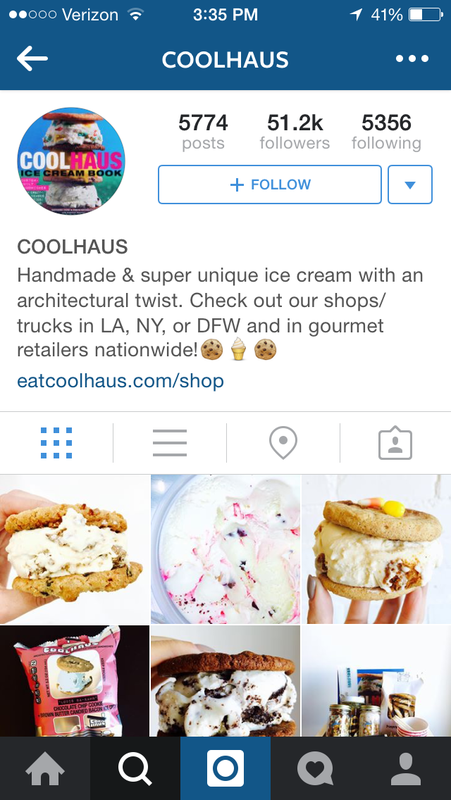 With that in mind, here are some tips to get the most out of your food truck’s Instagram account. Make sure you include your website in your Instagram profile so your fans can click through to your website to find your hours, menu, and location. Your profile photo can be an appetizing photo of our food or a glamour shot of your truck or logo. Unlike Twitter and Facebook, people won’t be using your Instagram to check in on your schedule or location. Users will be skimming their feed, looking for beautiful pictures to like and comment on. Your goal on Instagram should be to share the best of the best pictures you take. And you’re lucky to be in the food truck business because people love pictures of food. You can take pictures of your plated food or specials you’re having that day, pictures of your employees (with their approval!) serving food and taking orders, and well-framed pictures of your truck on location. Avoid blurry photos, photos that show too much mess in the background, and overly stylized filters. Do some research and check out other really popular Instagram accounts. You’ll see that those users choose a certain visual theme – whether it’s light and airy, or lots of bright colors and heavy saturaion – and stick with it for most of their photos. These helps achieve an overall sense of cohesion within your Instagram account. Think about your brand and what kind of photos would appeal to your customer base and use this to establish your Instagram aesthetic. If someone tags you in a great picture of your food or truck, share the love by regramming their photo. You can use an app like Repost that will allow you to share their image to your Instagram while easily tagging them in the process. This is a great way to engage your fans, show that you are keeping up with them on social media, and that you appreciate their efforts in helping promote your business. You can even create your own hashtag and encourage your guests to tag their own pictures to your custom hashtag. Like Twitter and Facebook, interaction is a big part of the social media game. Follow food trucks and some of your own followers and participate by liking what they post. If you’re at a food truck festival, as you taste food from other trucks, take a picture and tag them so you’re followers can see the kind of food you appreciate. If you work with local farmers, share pictures of your food that incorporates their produce and tag them so their followers can see how the food they grow gets used in the community. Doing this will help build your local network and solidify you as a cool person to do business with. Don’t feel like you need to devote hours a day to this, either. A few minutes here or there is all you need to get these kinds of relationships started. If taking high-quality, well framed images isn’t your thing, you most likely have someone your staff who loves to Instagram. Ask for their help and have them snap a few images a day to use for social media fodder. They can use editing software like Snapseed (a free app) to tweak lighting and saturation levels of images to achieve a consistent aesthetic for your brand. If you own and operate a food truck, you’re probably aware of the many obstacles facing trucks in the industry. But what happens when the hurdles you’re facing are being created by your own city? As food trucks gain popularity, cities are struggling to figure out how to fit them within existing business regulations. Food trucks from Las Vegas to Boston have faced a number of problems from their local governments such as time limits on parking, how close they can park to other food businesses, and even whether they can park on public property. If you’re a food truck facing tough laws that are hurting your business, take it upon yourself to get involved in local politics. You can help bring about the change you wish to see simply by meeting with and educating decision makers. The key to these interactions is friendliness, positivity, and a well-prepared vision statement of how great food trucks can be for your community. At Food On A Truck, we know how valuable your time is and how time-consuming it can be to fight for your business’s rights in public forums. We wanted to lend a hand, so we wrote this open letter that details why your business is a benefit to the local economy. You can share the letter with your information added on your social media, distribute to your loyal customers, and send en masse to your local representatives. Please feel free to share with other food trucks and let us know how it worked for you @FoodOnATruck. We know that when anything new is introduced into the city it can take some time to work out the new rules and regulations. However, in light of [describe the troublesome rules/regulations your city is planning to implement in relation to food trucks], we at [Your Business Name] were hoping you would take some time to consider how beneficial a rise in food trucks can be for [City Name]. Food trucks are in demand. People want quality food that’s also convenient. The food truck market has quadrupled in the past five years and there are expected projections that it will bring in nearly $3 billion in 2017. Our city can reap the benefits of this booming new economy. Food trucks are as safe as restaurants – and can actually be safer. In cities where the safety standards for food trucks are the same as restaurants, food trucks tended to outperform restaurants in safety inspections. It makes sense: we have one small kitchen we take with us everywhere we go! Food trucks are a financially accessible way for local entrepreneurs to start food businesses. Starting a restaurant business is expensive. A food truck can be a way for young people and those who want to avoid taking out large loans to harness their entrepreneurial spirit and participate in our local economy. Food trucks can help bring a wide range of food options to areas that may lack access to food variety or healthy foods. Whether arriving in a downtown business district or a neighborhood in which fast food is the only option, food trucks have the ability to close these gaps. Food trucks can help revitalize a space. By bringing hungry locals into the streets, you will see a renewed interest in and care for public spaces. For example, the Midway Food Park in Austin Texas has become a community hot spot once local folks began to see the virtue of a shared, public communal space. Food trucks can help other local business. It’s not uncommon for food trucks to team up with other local businesses. Food trucks have partnered with local bakeries to have freshly baked bread and pastries. They have developed relationships with breweries to provide food outside of tasting rooms. Food trucks bring people out into streets they may not normally spend time in – and once people are out, they tend to step into other local businesses. Successful local food trucks mean more money injected back into the local economy. It’s no secret that when folks have more money, they spend more money. By not inhibiting food trucks, you are helping to reinforce our city’s economic foundation. We hope you will keep these points in mind as you make decisions regarding food trucks in the future.